My first iPhone was an iPhone 4, so I missed the early days of the App Store, including a very popular game that released back in 2008 on the very first day of the App Store’s existence. That game is Trism, by Demiforce, and although I didn’t play it, I gather from videos I watched that you had to slide rows of triangles to match colors. It looks like an interesting twist on the match-three genre. For the ten-year anniversary of both the App Store and the game, Demiforce released a sequel, aptly named Trism II. There was no video available in the description, but I figured it would be similar to what I watched of the first game. And since I like match-threes, specifically those without ads or in-app purchases (IAPs), I wanted to give the game a try. I decided to take a chance on the sequel, since I imagined there would be improvements over the ten-year-old original. Unfortunately, it feels like a run-of-the-mill match-three game that you’ve played a few dozen times already. The only real difference is that there are no IAPs or ads to deal with. Perhaps it gets better later, but from what I played so far, I’m not sure I even have the interest to continue and see where it goes. In Trism II, there’s no sliding involved, at least from what I’ve seen so far. Instead, you place a colored triangle in a space next to other triangles and if there or more of the same color touch, they disappear, you get points, and some more triangles drop in to take their place. Pretty standard stuff. You can make special tiles like sparkling or rainbow ones by matching triangles in a specific shape. You can also earn power-ups that can be used any time. Again, it all feels very familiar, like they just took their triangles from the first game and dropped them into an already existing game. To shake things up, there are enemies to defeat and missions to complete. There’s also a story that makes me think of Teletubbies — and not in a good way. This feels meant for little kids. 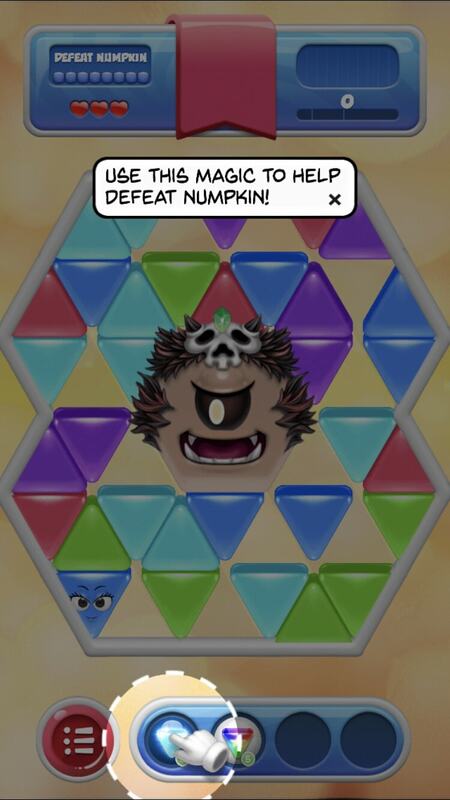 I mean, I’m all for stories in puzzle games, but not if it’s just tacked on as filler. Watching the story play out, I can feel my brain cells dying. A few minutes in, something did happen that made me think and hope for a brief moment that everything up to that point was a parody and now the real story would start. But nope. The same tone remained, and it feels like the game is constantly talking down to me. I don’t play many free-to-play match-three games, so maybe this is how they all are and it’s just emulating them. But I’d like a game to respect my intelligence at least a little bit. I also don’t like that the game seems to expect you to use power-ups to complete the levels instead of doing so by making matches normally. Games like Candy Crush would do this sort of stuff to get you to spend money on those power-ups. But in a game where there are no IAPs, it would have been nice if it was focused around skill and strategy rather than using crutches. Early on I already hit some levels where it seemed to be pushing me to use “magic” in order to earn enough points. And I’ve been forced to use them, as well, even when I didn’t want to. I appreciate the lack of pay-to-win shenanigans in the game, but it’s still not the kind of experience I want. I should also mention that the game bugged out at the end of my video above and I couldn’t do anything. It seems to be working again after killing the app, but just be aware that it is a bit buggy. At this rate, I don’t know that I’ll continue with the game. I’m tempted to actually buy the original because it looks more mature and more skill-based than this one, but I’m not keen on throwing away more money right now. In any case, if you still want to give it a try, you can download it here. And check back here for more gameplay videos if I decide to play more.